Then. Now. Forever. 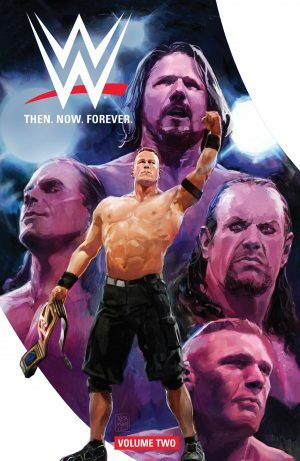 is a real hodge-podge anthology of stories about WWE greats past and present, the page length of individual stories ranging between one and sixteen. 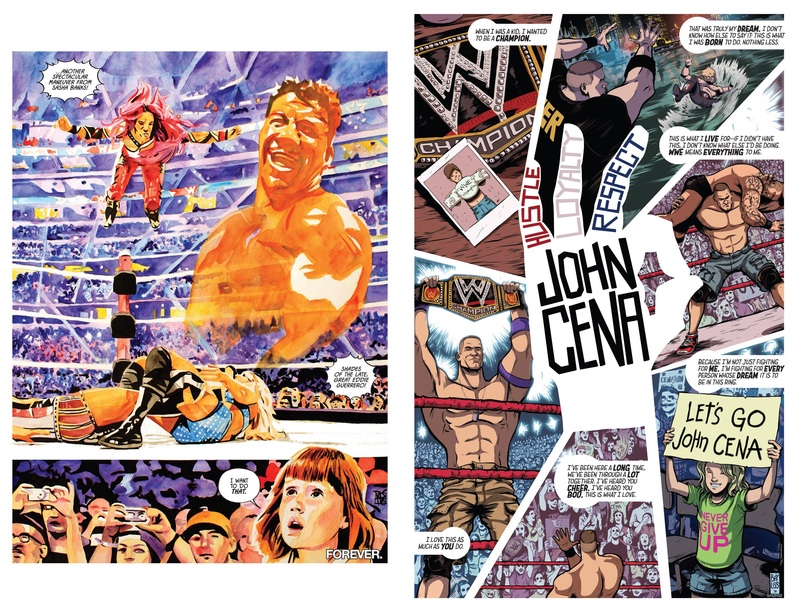 The shortest material was originally found in as back-up strips in the regular WWE comic, but omitted from the graphic novels, and there’s not a lot that can be done beyond the obvious in two pages. Tini Howard makes the best attempt, defining Finn via a faux folk tale, and having the bonus of regular WWE artist Serg Acuña, and Derek Fridolfs’ Tugboat strip in the style of Popeye is charming. Within the slightly longer stories thre’s room for greater explorations. For all that, almost all the content is first person narratives of wrestlers explaining themselves or interview captions with the wrestler answering on panel. The longest of them is Ryan Ferrer and Clay McCormack revisiting the mid 1990s turning point for the Undertaker and Mankind, with Paul Bearer instrumental in events. For what were WWF followers at the time it was a fantastically scripted drama and totally unexpected, but McCormack’s loose and scratchy art doesn’t do the piece justice. 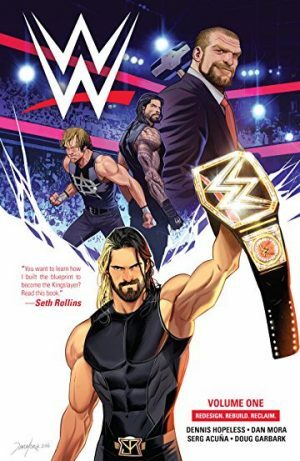 Although designed around his cartooning, the same could be said about Rob Guillory’s version of the New Day, a wacky time travel story that has all of Guillory’s style, but little of his visual invention, and the decision to run with pink as the primary colour hurts the eyes. 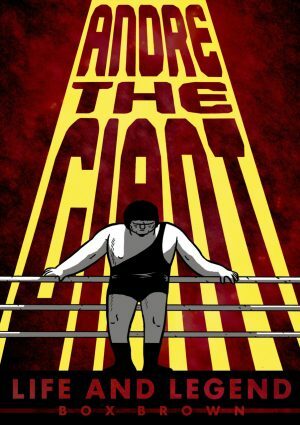 If a single story exemplifies the WWE ethos of try, try, and try again it’s ‘You’re Good, but…’ in which Aubrey Sitterson and Kendall Goode present the story of Daniel Bryan. A technically gifted wrestler, he lacks the faked identity, nickname or easy label, so is considered dull and without star quality. 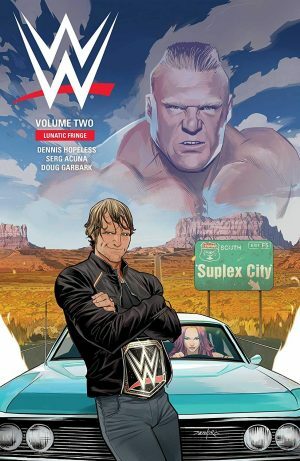 The story is one repeated throughout the WWE comics, and the would-be achiever aiming for the big time is a staple of WWE scripting, but this compressed version nails the essentials. 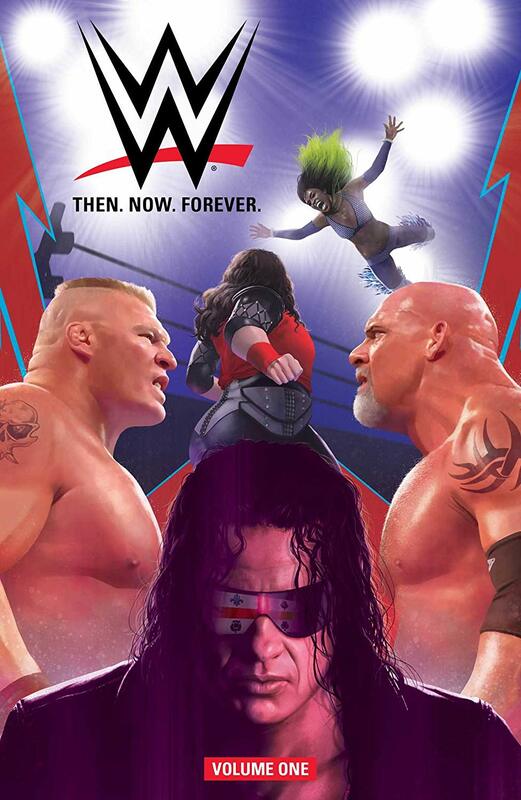 WWE fans will probably lap up the chance to see spotlights on stars and to relive some of the wrestlers’ greatest moments. For anyone else it’ll be a harder sell. There is a volume two.